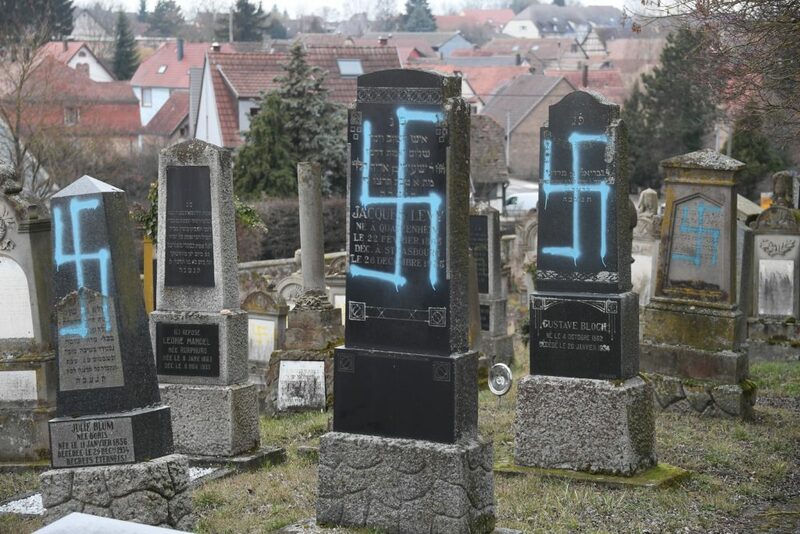 (JTA) — Almost 100 gravestones at a Jewish cemetery in France were discovered vandalized with swastikas hours before the start of marches Tuesday against the recent rise in anti-Semitic attacks in the country. French President Emmanuel Macron visited the cemetery in the eastern French village of Quatzenheim, near the border with Germany, on Tuesday afternoon and promised that his government would take action. Local Jewish community representatives joined Macron as he stood in front of the graves vandalized with blue spray-painted swastikas and observed several moments of silence, The Associated Press reported. The French president is scheduled to hold a moment of silence with other French leaders on Tuesday evening at the Holocaust memorial in Paris. In response to the cemetery vandalism, Israel’s immigration minister, Yoav Galant, in a tweet called on French Jews to “come home” and immigrate to Israel. “The desecration of the graves in the Jewish cemetery in France is reminiscent of dark days in the history of the Jewish people,” he wrote. Israeli Prime Minister Benjamin Netanyahu in a statement Tuesday called the vandalism “shocking” and said French and European leaders must take a strong stand against the “plague” of anti-Semitism.